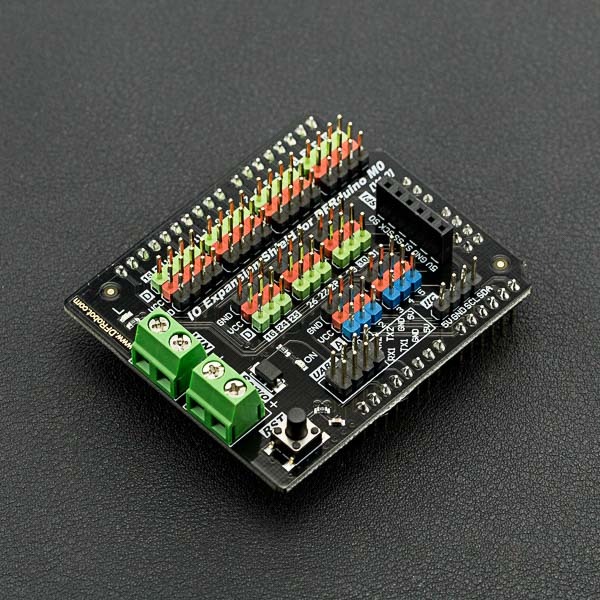 The IO expansion shield which is special for DFRduino M0, it extends 31 general pins from M0 board, together with DFRobot typical color code 3-pin interference. This interference has sole power supply and can connect to the sensors directly, which make the shield have excellent scalability and compatibility. The IO expansion shield for DFRduino M0 has inputs for external power and servo's power, to ensure the stability of powering the module. Its powerful scalability and ease-of-use can help electronics enthusiasts or prototyping developers eliminate the cumbersome breadboard wiring and troubleshooting time, greatly improving development productivity and enabling them to focus more on achieving their originality and ideas. Note: This product is only applicable to DFRduino M0, Bluno M0, not compatible with other motherboards such as Arduino Zero. The operating voltage of DFRduino M0 is 5V, so the extended board supports 5V digital sensors only. The analog input pin of the expansion board can endure 0~5V. A LED is designed on the extension board, which is connected to the digital pin 13 (LED). The expansion board provides 2 serial ports and one I2C interface, in which the two serial ports are independent. Provides external power input interface, external input power supply has two kinds of interface can choose, can input from the floor or by the expansion board input (not at the same time, input) input voltage is controlled in 7~23V. when the USB and the external input power supply at the same time, it will automatically switch to the external input power supply. The IO expansion Shield has an external servo power port. It could provide enough power resource when you want to do drive a lot of device together. Especially servo motor. Once you connect >5V to the port. it will auto switch power resource. 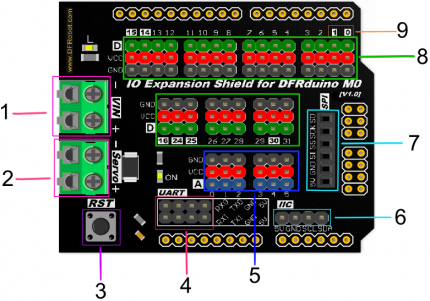 Get Gravity: IO Expansion Shield For DFRduino M0 from DFRobot Store or DFRobot Distributor.